I asked Siri to call the person back and my hubby said something about two feet away from me. I forgot he was taking the day off today ;). So instead of writing all day, we went to Bass Pro Shops (the original one), discovered they don’t carry the coat I want in the right size (I wasn’t sure I was going to get it – and no online searches have showed it on sale anyway), went to lunch, then home. Went to pick up Kid #2. Took Jett with me. He loves to “go bye-bye” and spins in circles when you ask him (part of where he got his name from). When we get there, he stands and watches for any of his kids (band kids stop and say hi to him – and me – all the time) to walk by. Pretty sure he’s sniffing their lunch leftovers as they walk by, too. I’ve been hanging out with my family since, but everyone’s headed out to evening plans so I’m planning to write. That’s Jett. We’ve had him 2 years and 2 days :). He was mad at me this morning for making him go outside to do his business ;). It was cold and more than drizzly but less than rainy. He hates cold and rain. 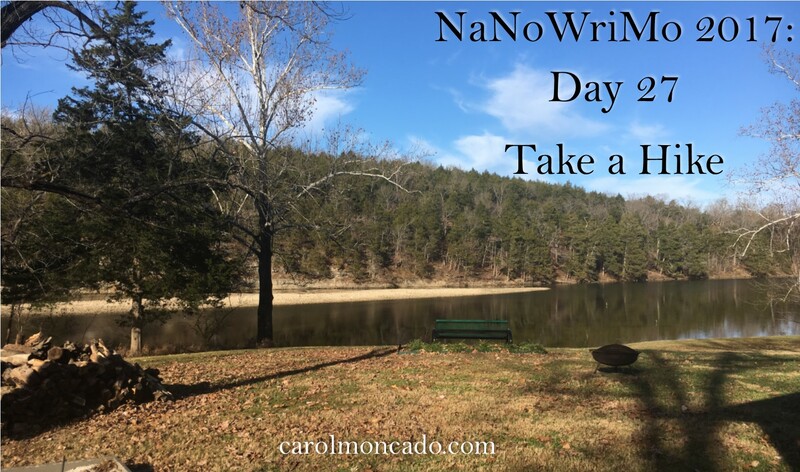 I’m a NaNo Purist. 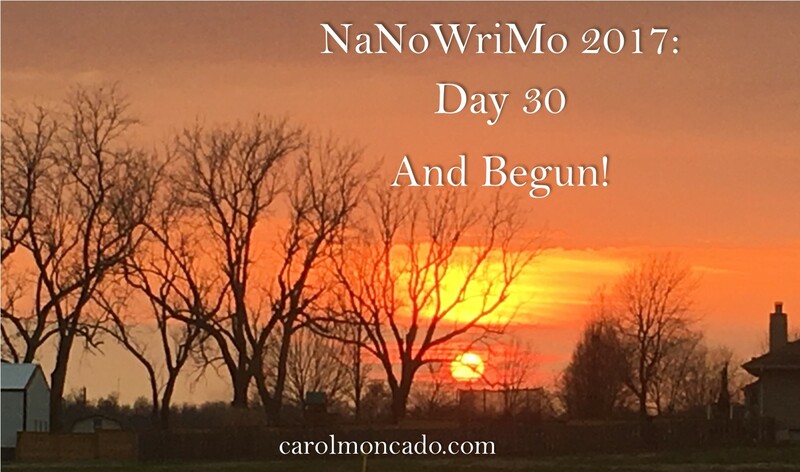 That means I think real NaNo is starting a new project on November 1 (often at midnight) and writing 50K words on it. I’m in the middle of The Spare and the Heir (releasing December 21) and it HAS to get finished. And later this month – 16 days – I’m headed to NYC with my oldest daughter and a friend of mine. My daughter gets to march in Macy’s Great American Marching Band and I can’t send her across the country all by herself! What does that mean for TSATH? It HAS to be done before I leave. In fact, I probably need to take a paper copy with me to edit while I’m there, though I doubt I’ll make it through, but we’ll have some down time. Last night, I was writing. 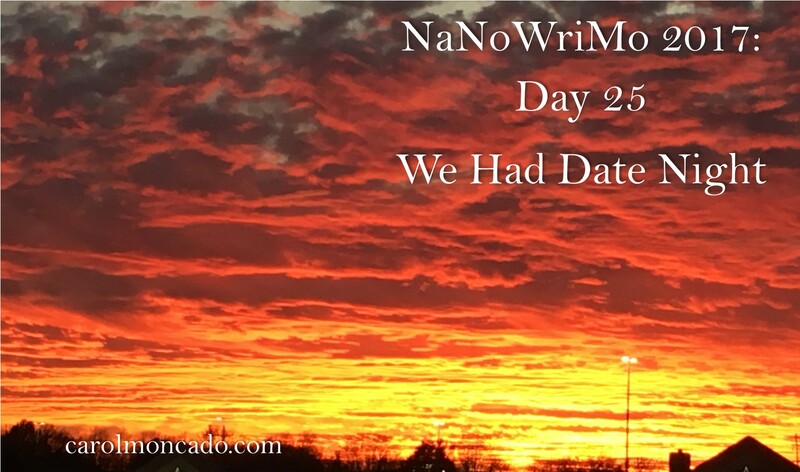 I started a new scene right at midnight so I counted those words toward NaNo. I’ve already done some writing today, but also had lunch/brainstormed with a friend and did some mathy/businessy stuff. Plus a kid to the doc and hanging out with the fam. Now back to work. 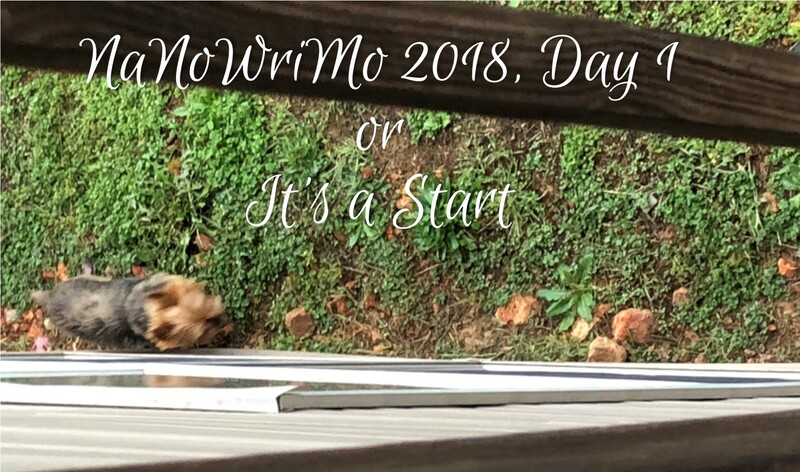 I didn’t say it was a great start… but it’s a start! 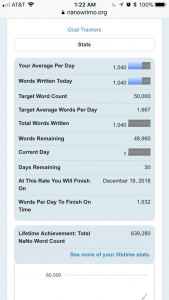 I didn’t hit my goal of 100K words, but that’s okay. I did finish the book for my cousin which was my top priority. I didn’t get as much done on The Inadvertent Princess as I wanted, but that’s all right. I’ve got several weeks before I need to have the draft finished. I’m still pleased with my progress though. The screenshot is from when I passed 70K for the month. Today, I’m working on Inadvertent some more. Because that’s what I’m working on all the time these days ;). 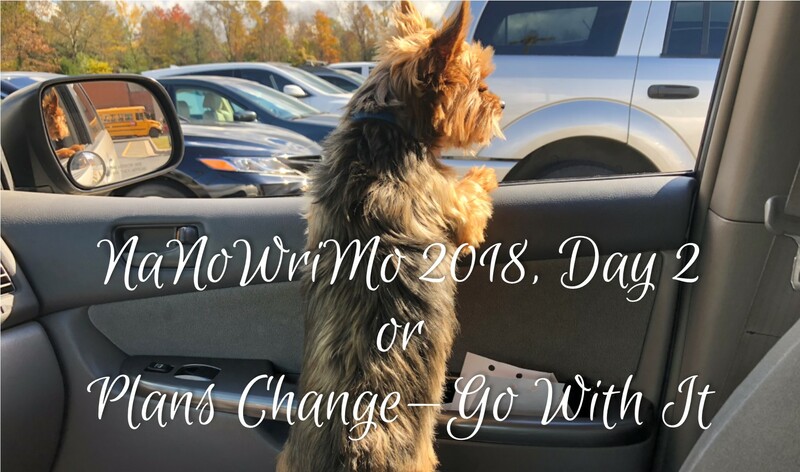 #NaNoWriMo2017, Day 30 or And Begun! Last night’s sunset was absolutely gorgeous – and this picture does NOT do it justice at all. I think I got some on my actual camera that turned out better, but I haven’t pulled them yet. It was much more pastel-y than this. I did get some writing done on Inadvertent Princess last night. I also did some brainstorming with my first reader. Some of it finally all came together (Prince Isaiah is sleazier than we all thought but that shouldn’t surprise anyone). 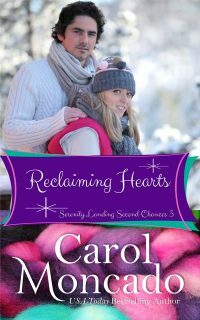 Today, I’m uploading the retitled In Concert with the King to Createspace so I can order a paper copy to send to my cousin. Then back to work on Inadvertent :). 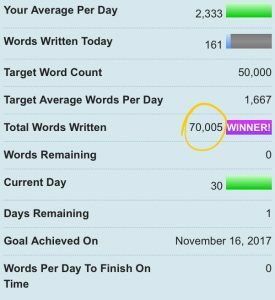 I’d hoped to be further into it by now but… Hey – I’ll pass 70K words for the month! Nothing to sneeze at! 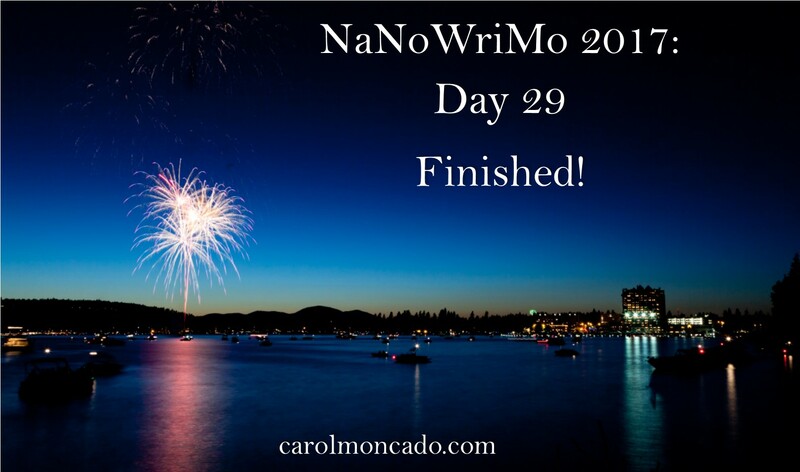 #NaNoWriMo2017, Day 29 or Finished! I finished the first draft of In Concert with the King (which is getting a new title before it releases :p)!!!! 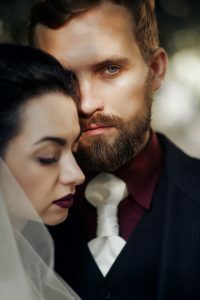 The draft is wrapped up though it still needs about 3 chapters in the middle (maybe a bit more and will likely include some Prince Harry/Meghan Markel stuff since it’s established that Prince William and Catherine, Duchess of Cambridge are friendly with my fictional royals). Part of it will depend on when the wedding is and where that falls in what I’ve got going on already on the fictional calendar. The end needs some tweaks too, but it’s basically done as far as a first draft goes, so I sent it to my cousin last night. And with that, I also reread Inadvertent Princess and started working on it last night too! YAY! I’ve got a lot going on today, but I should be able to get some words in tonight, so more yay there! 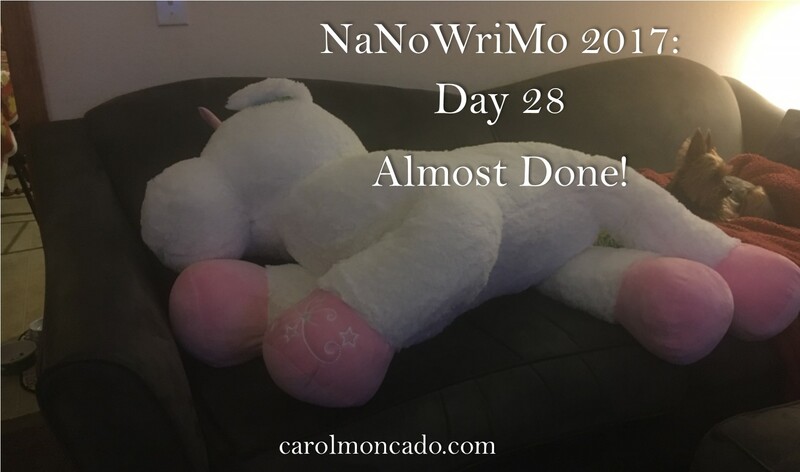 #NaNoWriMo2017, Day 28 or Almost Done! Yes. That’s a giant unicorn. And now that it’s /sob/ been given to it’s intended recipient, I can post a picture. Of course I didn’t take a better picture, but… :p I wanted to keep it. The kid that bought it for a friend refused to let me. Sigh. But on bookish things… SO. CLOSE. TO. DONE! 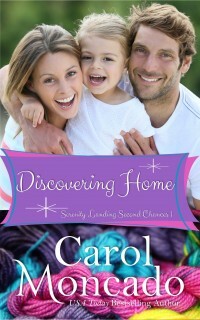 I have just the epilogue to write, then about 3 chapters left in the middle, but I’ll do those later on. I’m going to try to get the epilogue done in the next hour or so then start my readthrough of The Inadvertent Princess so I can start writing on it again tonight. Or so the plan goes. Did I mention I’m changing the title of In Concert with the King? The perfect title for it came to me the other day. Way more perfect. Because the piano playing didn’t play as big a role in the book as I thought it would. And this title really is better. But I’m not quite ready to reveal it yet. In case it changes again :p.
I’m not going to hit my 100K goal for the month, but that’s okay. Maybe 70-75K. I’ll take it. DID Y’ALL SEE THE NEWS?!?!?! Prince Harry is engaged! I’m so looking forward to this royal wedding – I may even have to wake up early enough to watch it live ;). For research, of course! Speaking of… Dare You is free for another day or so. 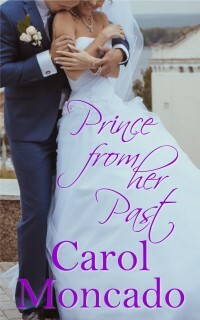 Heart of a Prince (a Canadian, not an American, but still a NORTH American ;)) is 1.99 through today and then 2.99 through 11/30. After church yesterday, we went down to my in-law’s new house about 45 min away. They don’t actually have a lake view, but the houses behind them are kind of across the street. Their community has a little park area on the lake and we went down there to make S’mores. 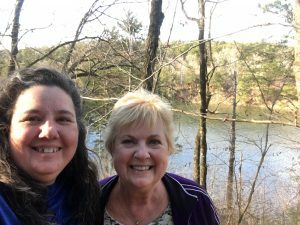 My stepmother-in-law and I went for a hike through the woods nearby. It wasn’t tough, though there were a couple of fairly steep spots. My hip didn’t love it though :/. 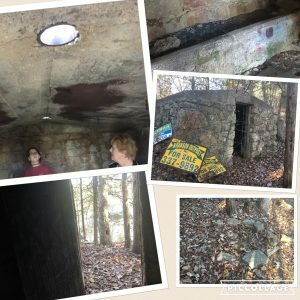 The views were gorgeous, and she showed us this old building that we think used to be a smokehouse. It was pretty cool! There’s some other ruins (that I didn’t get a pic of :p) that we’re not sure what it was. It’s on a hillside, but the rock wall remnants aren’t wide enough to be rooms. We wondered if it might be stalls for a barn or perhaps “floor joists” type things to sort of level out the hillside (but not all of them are as tall as they use to be so it’s not obvious? ), but we’re not sure. When we got back to the house, we celebrated my father-in-law’s birthday. And deer showed up ;). There’s only four, though there’s a total of five in the pics (one in there twice). Photo cred to Vicki! 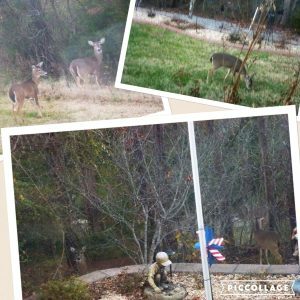 The first time I was at their house, I saw a buck in the backyard. Super cool! They see all kinds of wildlife! We came home, and I picked my Andy Griffith Show marathon back up (started after the death of Ron Howard’s father the other day). Slept through about 6-8 episodes, but the headache finally started to go away. Got some writing done after that and finally one spot I need done – finally. It was harder than I thought, but finally done. 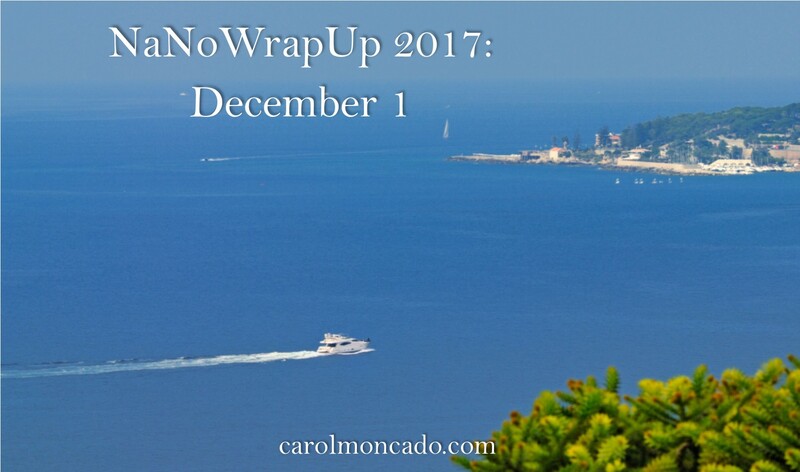 Only two partial scenes left then the epilogue. 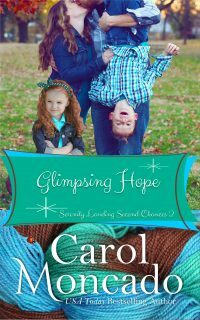 Maybe one more before the epilogue depending on how long it takes to wrap it up. Fingers crossed for today. 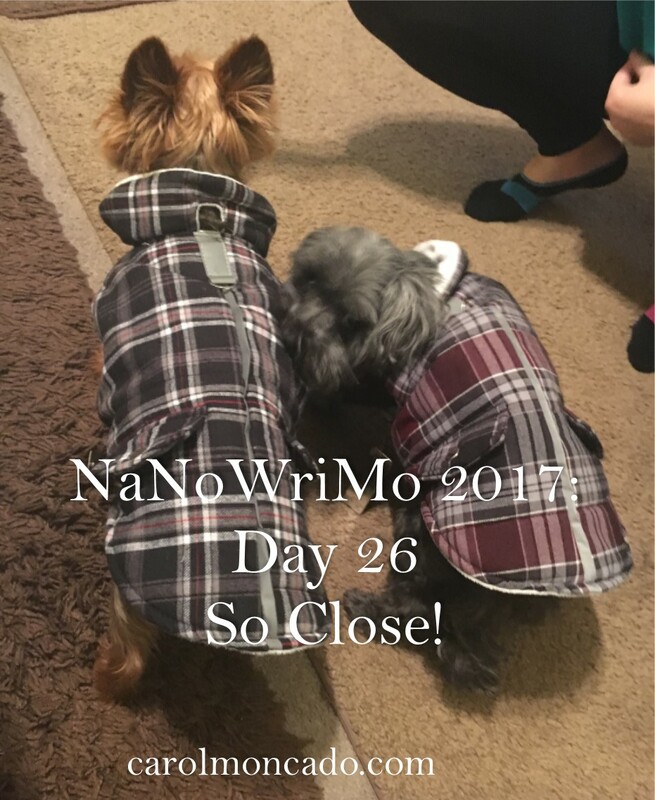 #NaNoWriMo2017, Day 26 or So Close!!! I. Am. So. Close. to finishing this book! I have three partial scenes to write. Two I wrote parts of back in May or so when I was at a workshop of some kind and was doing an exercise. One I started last night but didn’t finish. There might be one more scene after that, but not sure. Here’s hoping I can get it done today! We’ll see though. First, church. Then we’re going to my in-law’s for my father-in-law’s birthday. 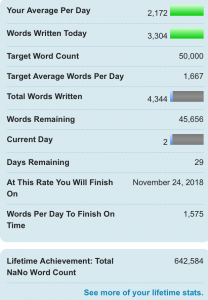 But I write best late, so there should be time tonight to get to “the end.” I do have about 5-8K worth to fill in in the middle, but that’ll be done later most likely. Time to head out :). Last night, Kid #1 worked from 4-8, so the hubs and I decided we were going to go out. On a date. Kids #2-4 are old enough to stay home unsupervised, at least for a few hours. And my sister lives close. So do the several cops we know in the neighborhood, should something happen while we’re gone. That pictures is the sunset last night. I took the pic as we walked out of one of the local Walmarts. We also went to Target, Kohl’s, a new home store that I don’t remember the name of, Marshall’s, Ross, TJ Maxx, PetsMart, and back to the home store to get dog sweaters of all things. My dogs are little and they get cold and have a hard time warming back up. I always said I’d never put clothes on a dog but… here I am :p.
We also went to Chili’s for dinner. Then Culver’s for dessert later. They’re in the Target parking lot, and if you bring in your Target receipt, they’re doing BOGO dessert. Since I bought a friend a present (clearance baby! ), we got a free frozen custard :D.
I did a little bit of writing last night. Words aren’t coming easily, but I made progress, both with word count and story. One really good day would get me to the end of the book, though I’d still need to fill in some of the middle later. Also… sale! Dare You is free through 11/28. 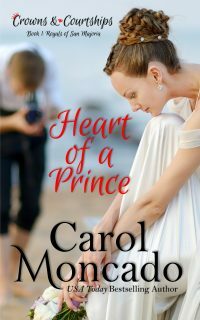 Heart of a Prince is 1.99 through 11/27 then 2.99 through 11/30. Grab them while you can! 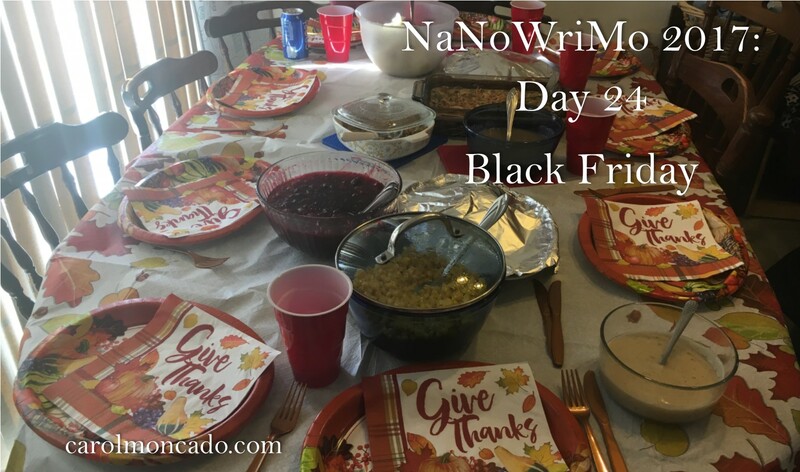 #NaNoWriMo2017, Day 27 or Black Friday! I hope y’all had a great day yesterday! We did! My mother-in-law, stepfather-in-law, and sister came over. We did lunch, hung out for a bit, then hubs, three kids (one came home after a bit), a boyfriend, and my sister went shopping. They weren’t out long last night. I went to Walmart today. Hubs and Kid #4 went a couple places today too. I Do. Not. miss working at the mall today. Not even a little bit. 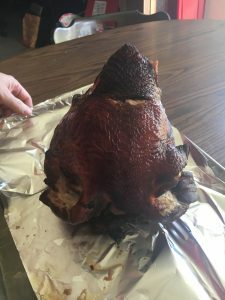 Hubs smoked our first turkey yesterday. It was de. lish. ous. All the yum. I didn’t feel great last night so ended up writing not much at all. Here’s hoping for a better today – at least until date night ;). Powered by WordPress and Air Balloon Theme.